← Which Came First: The Chicken or the Hot Sauce? To those who actually got the Willy Wonka reference in my title, bravi, for I was figuratively transported to a restaurant that was a veritable horn o’ plenty of delicious food and exquisite beers. I received my golden ticket to this factory of culinary wonders, Owen and Engine which is located at 2700 N Western Ave Chicago, IL, from my friends Eileen and Justine. They were playing it up for a long time about how wonderful the dishes are, so we decided to take a journey there in order for me to see if this truly was the Shangri-La of sustenance they were making it out to be. At first, Owen and Engine did not grab my attention immediately as the façade of the building was a simple one, but upon entering it seemed like any pub I’ve been to in London or in the UK in general, classy and understated. However, I was generally worried due to the Hipster-ish attire of the hostess/waiters/bartenders (i.e. vintage flannels, Ray-Ban wayfarers, and ironic facial hair), but once I was seated my fears were allayed due to the genuine passion our waiter had for their beers. Once he was done rattling off 25 different beers of the day, he thankfully explained the menu due to the fact that there were certain items that I never even heard of but of course was going to try. 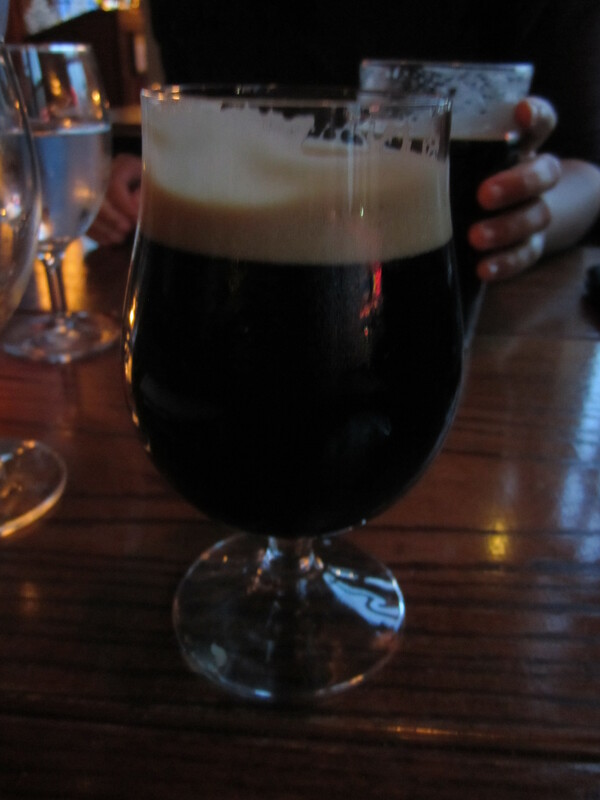 For starters, I went with the Old Rasputin Imperial Stout which definitely did not taste as nefarious as its namesake nor gave me free reign over the Russian Empire while wooing the czarina (unfortunately). However, it definitely gained a special place in my heart due to its deep black coloring that belied its heavy dark chocolate and bitter aftertaste. that was served with whole wheat flatbreads seasoned with sea salt and the beef carpaccio which was garnished with rocket and olive oil. 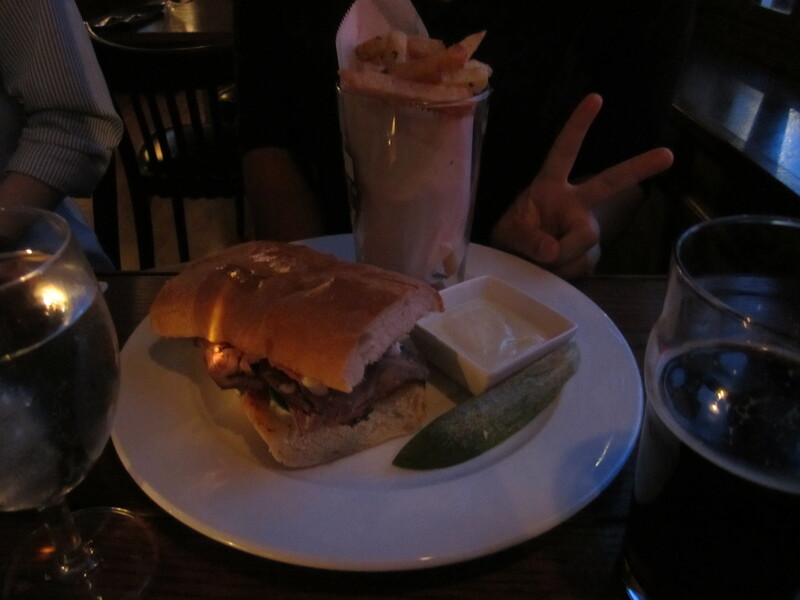 As for the other lovely ladies at my table, Eileen went with the gnocchi (a gutsy move for ordering Italian food at an English pub), and Justine decided on a safer but equally tasty steak sandwich. Plus, they ordered a tub of squeak (or mashed potatoes for those on the westside of the Atlantic) for everyone to share. When my food came out, I initially thought that I had received the short end of the stick since my orders seemed to be lacking the body and presentation of the ladies’ dishes. 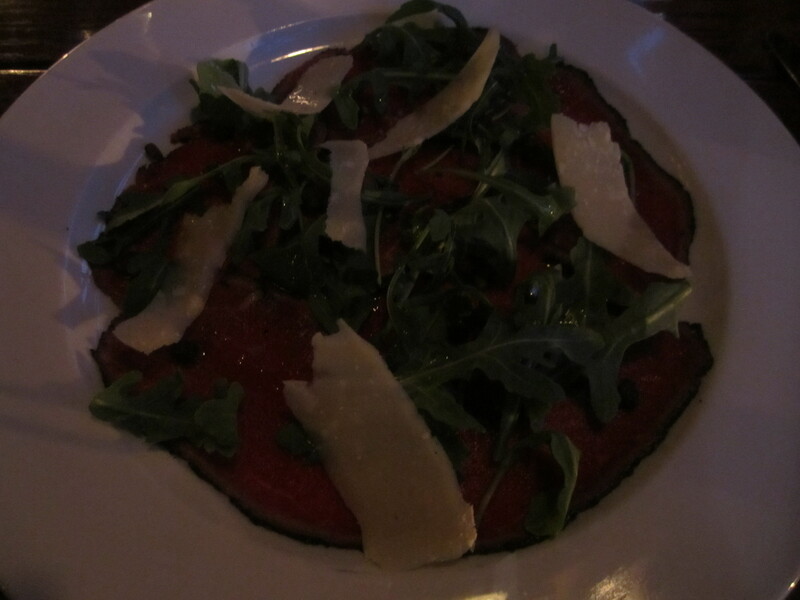 I started my meal with the beef carpaccio. It was absolutely delectable as the lightly seasoned, juicy beef was sliced paper-thin, almost to the point of falling apart on my fork. The rocket and olive oil provided a fresh herbal aftertaste to the savory meat. On the whole, it was a lot more filling than I expected. As for my pork rillette, I was definitely surprised to see the overall presentation since I was expecting more pork than flatbread. 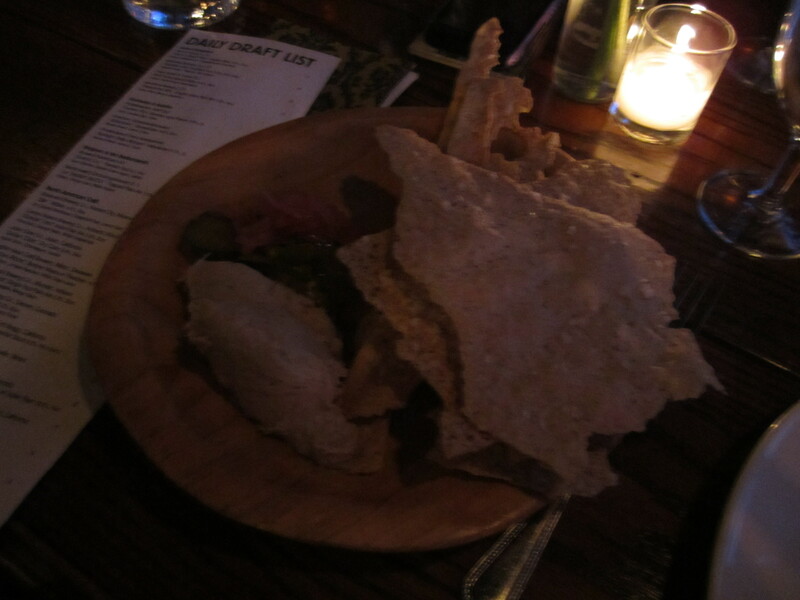 I can only liken the actual rillette to a thick, coarse butter that tasted like pork chops, and the sweet pickles provided a sugary contrast to the salty flatbread/pork. This dish, however, was not my favorite as the flatbreads quickly became a thorn in my side due to the fact that they were VERY liberally coated with raw sea salt. Before long, my tongue felt like it was turning into beef jerky, so I would advise those who don’t enjoy really salty food to avoid the rillette flatbreads. After tasting these two debutants, I managed to get a sample of the gnocchi that really blew me away at how molto bene it really was. The dumplings were lightly buttered with oregano garnishes, and it was ramped up to the next echelon with the use of smoked bacon chunks to give them a meaty body to round out the flavor (definitely not the soggy tater tots I was expecting them to pass off as authentic gnocchi). As for Justine’s steak sandwich, it was quite hearty with a refined flavor due to the balance of beef with the zesty horseradish mayo. Justine's AZN pose with STEAK! The high quality meat possessed a smidgen of fat to make the sandwich sizzle with flavor. As always, I saved the best for last: the squeak. It seemed like just a simple bowl of mashed potatoes with chives on the top, but as soon as I took a bite…I was in ecstasy. Need I say more? (just for posterity’s sake, the potatoes were churned to perfection with bacon, cheese, and a certain je ne sais quoi. Definitely the dark horse of the dinner that outshone the other dishes). The end of the meal was quite enjoyable since we somehow managed to get a free dessert just because Justine is such a baller and knows everyone there. 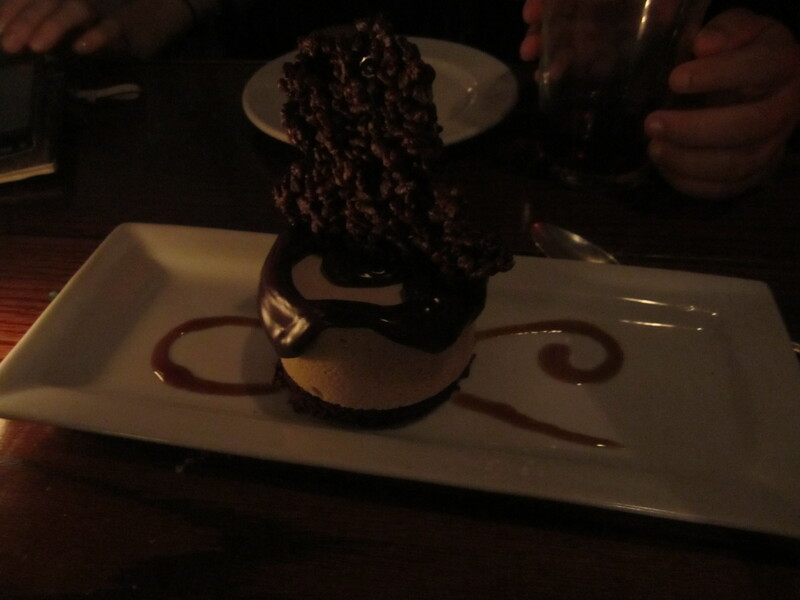 It ended up being this chocolate beer based mousse souffle which had a triangle of chocolate rice crispies driven into its center like some sort of beautiful sail on a catamaran of sugary paradise. Plus, the souffle was flanked by two espresso syrup flourishes on the plate which gave the cake underneath the mousse more of a tiramisu consistency/flavor. I don’t know if they offer this dessert on the usual menu, but the chocolate beer combined exquisitely with the moist, coffee laden cake underneath to leave my palate in some sort of Frapuccino-esque heaven (don’t sue me, Starbucks, por favor). Once we paid our bill, we bellied up to the bar to delve further into this veritable beer treasure trove. Our bartender was named Charlie (who bore an eerie resemblance to a grown up Charlie Bucket from Willy Wonka which made me believe he somehow inherited this amazing restaurant from an eccentric Gene Wilder-type beer wizard after going on a tour which included feeling the furry wallpaper-walk upstairs and you’ll see what I mean), but I digress and then some. 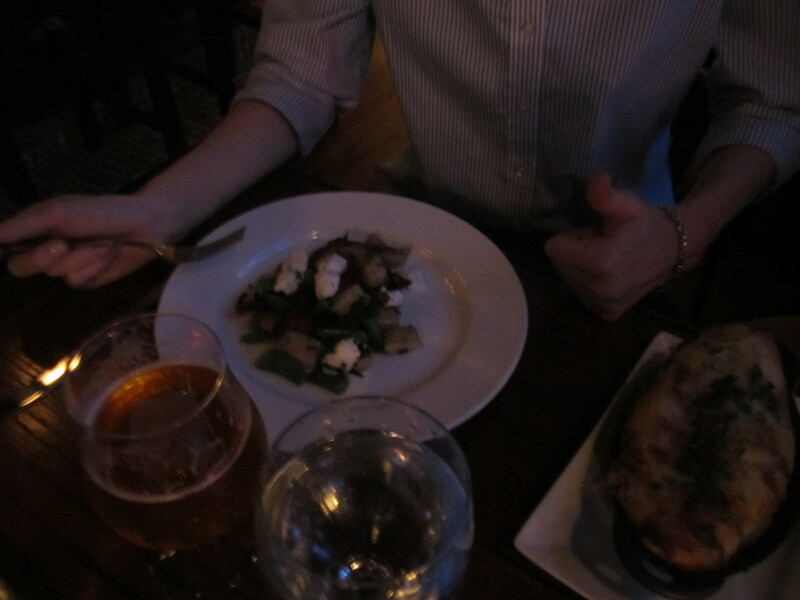 However, he was very knowledgeable being a certified cicerone (the beer version of a sommelier). I was taken aback when he asked me what I liked in a beer, and like a trained Spider monkey, scurried about and brought out two bottles that I would proceed to drink that night solely chosen off my criteria of a full-bodied, bitter, dark ale. 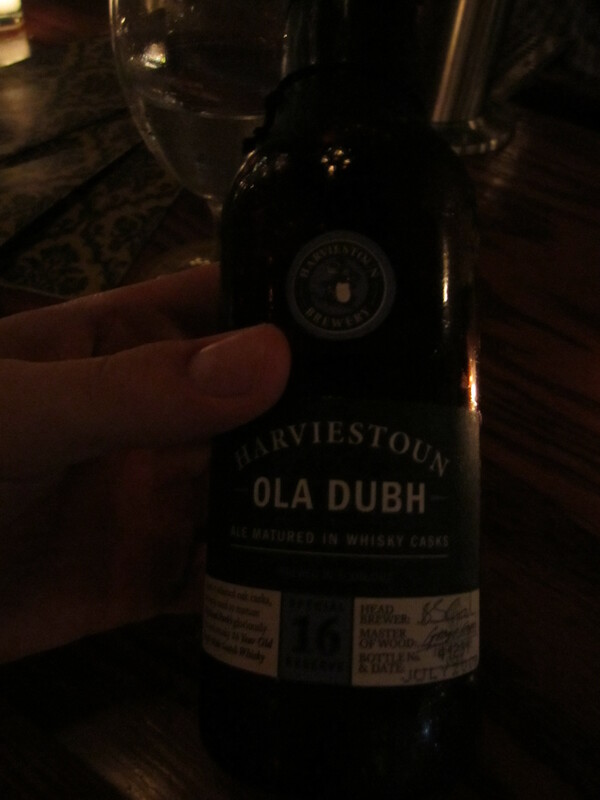 My first brew was Ola Dubh which hails from mighty Scotland. Where Ya Hail From Laddy? The name, funny as it may look, actually means “Black Oil”, and it certainly lived up to its moniker as it looked like I was literally drinking crude oil. Even though it seemed to be terrible based on looks alone, the taste was quite robust and bitter which was further enhanced by placing a candle underneath it to warm it in order to further open up the hops which normally leads to a better aftertaste. 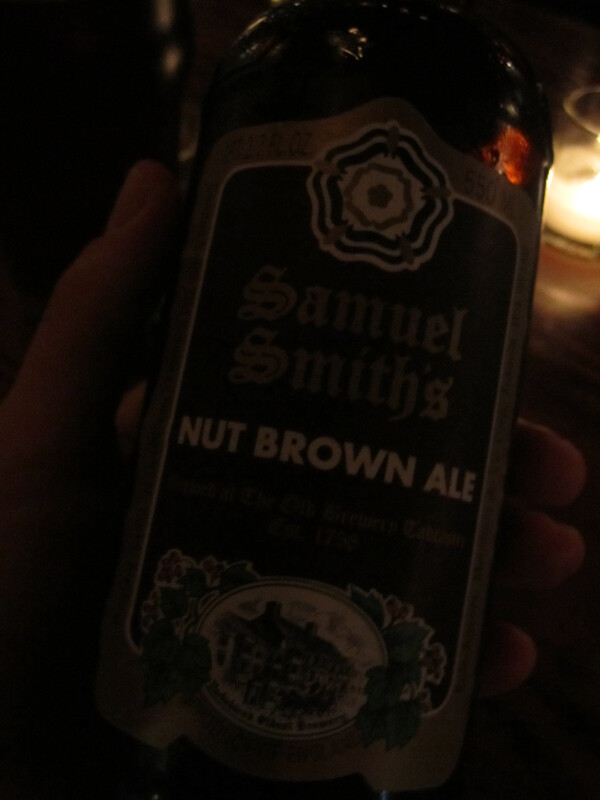 My second choice was a Nut Brown ale which was not as strong as the first since it didn’t look like something I’d drill from the ground in Venezuela, but it was a very warm beer that had chestnut undertones and a slight bitter aftertaste. As for the nightcap, I tried the Hoss beer which was a pale ale that was the complete opposite of how I started since it was a light translucent yellow with a taste of grass and a hint of lemon that gave the beverage a light and clean finish. In the long and stout of it all (beer pun intended), Owen and Engine definitely got me revved up to return as soon as possible due to its intimate atmosphere, great food choices made with only the finest ingredients, friendly/knowledgable staff, and the astronomically long list of artisanal beers from all over the world. 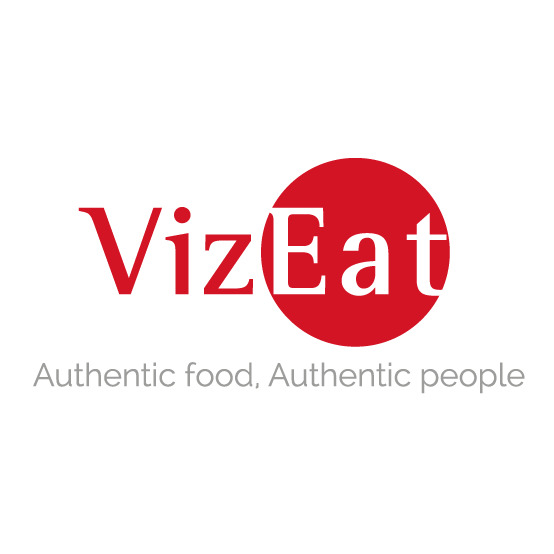 Posted in English, European Cuisine, Italian and tagged Bar, Beer, Beverages, Carpaccio, Chicago, Desserts, Engine, English, Gnocchi, Gourmet, Owen, Pub, restaurant, Sandwich. Bookmark the permalink.